On March 19, lower schoolers enjoyed a performance from KCD Orchestra Director James Racine (aka Maestro J) and his band. Mr. Racine is also KCD’s director of diversity and inclusion, and he said that the goal of the performance, called “Inclusion Through Music,” was to find a way to talk about stereotypes that would be appropriate and enjoyable for a lower school audience. Students were clapping and singing along to the performance of recent pop hits, which allowed Mr. Racine to also touch on more serious topics. 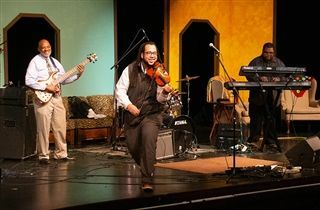 “The focus was to break a few barriers,” said Mr. Racine, “such as what a violinist looks like and what can be played on a ‘classical’ instrument. Breaking down stereotypes is a theme I have been working on in other divisions through assembly talks. With the Lower School, I thought that it would be more appropriate to do it with a concert, something the kids would truly enjoy but still get the message."